“The Word of the Father without a beginning (anarchos) has received a beginning in time, without separating Himself from His Divinity”. “The Ancient of Days makes Himself a Child according to the flesh”. “He who gave the Law to Moses on Sinai…to observe His Law has Himself brought to the temple”. According to ancient Jewish religious practices, as set down by the Mosaic Law (Leviticus 12, Exodus 13:12-15), a period of 40 days from the birth of an infant must pass before the mother and child could enter the Temple in Jerusalem. This 40 day period allowed the mother of a newly born infant to recover from her pregnancy, become well acquainted with her child, settle into her new role and routine, and subsequently be excused from her religious duties. Furthermore it was the time allocated by the Mosaic Law (Lev. 12:2-4) in which a mother and child would undergo the process of “purification” (spiritual preparation), so that the two could present themselves within the Temple, with the mother reassuming her religious obligations, while the infant being initiated into Jewish religious life. The custom itself recounts the test of faith and initiation of Abraham (Gen. 22:1-19), who was called upon by the Lord to sacrifice his sole legitimate heir and son, Isaac, whom he loved immensely. Naturally the Author of Life (God) did not seek the sacrifice of beings created within His own image, and so stopped Abraham from proceeding in conducting the sacrifice of Isaac. He thus commanded Abraham, by providing him a ram caught within a thicket, to instead offer the ram as a whole-burnt offering to Himself (God) in order to redeem the life of Isaac, and make a dedication of faith on Isaac’s behalf. This was the foundation on which Jews journeyed to the Temple to make a sacrifice of whole-burnt offering when presenting (dedicating) a child into the liturgical life of Judaism. For those who could afford it, rams were purchased at the Temple for sacrifice, while those who came from lower income earning professions, the Law substituted the sacrifice of two turtle-doves or young pigeons as whole-burnt offerings since one was for holocaust and the other for a sin offering (Lev. 12:8). The choice of turtle-doves or young pigeons was symbolic, since they represent purity, peace, hope and innocence, (consider the story of the dove returning to Noah with an olive branch). Naturally with Christ becoming human at the Incarnation, in effect humbling Himself before the Law, He had in effect became subject to its tenets despite being beyond its scope (for remember He was the Lawgiver and its chief exponent!). Therefore it was only natural that He too would be initiated into Jewish religious life in the same manner as all other Jews who had to be brought before the Temple to present their sacrifice for dedication, for He Himself cited that He did not come to destroy the Law but to fulfill it (Mt. 5:17). Within our Orthodox Christian Tradition this rite of passage continues to our present day, whereby the parents of a newly born baby is brought to church at 40 days of age and presented to the priest who reads a series of prayers standing either before the icon of Christ (for girls) or proceeding into the altar (for boys), offering them up as new members being prepared for entry into Church life. This particular feast day is unique in that it combines elements of both a Great Feast of the Lord and a Great Feast of the Theotokos. It has a forefeast of one day, and an afterfeast of seven days. However, if the feast falls during Cheesefare Week or Great Lent, the afterfeast is either shortened or eliminated altogether. The holy day is celebrated with an All-Night Vigil on the eve of the feast, and a celebration of the Divine Liturgy the next morning, at which beeswax candles are blessed. This blessing traditionally takes place after the Little Hours and before the beginning of the Divine Liturgy (though in some places it is done after). The priest reads four prayers, and then a fifth one during which all present bow their heads before God. He then censes the candles and blesses them with holy water. The candles are then distributed to the people and the Liturgy begins. Other early surviving references to this feast day come from sermons written by the bishops Methodius of Patara († 312), Cyril of Jerusalem († 360), Gregory the Theologian († 389), Amphilochios of Iconium († 394), Gregory of Nyssa († 400), and John Chrysostom († 407). Originally, it seems that outside of Palestine, the feast remained as a minor celebration. However in 542 AD the feast was established throughout the Eastern part of the Byzantine Empire by the Emperor Justinian I. The reason for this gesture was that in 541AD a terrible plague had broken out in Constantinople, killing thousands. The Emperor, in consultation with the Patriarch of Constantinople, ordered a period of fasting and prayer throughout the entire Empire. 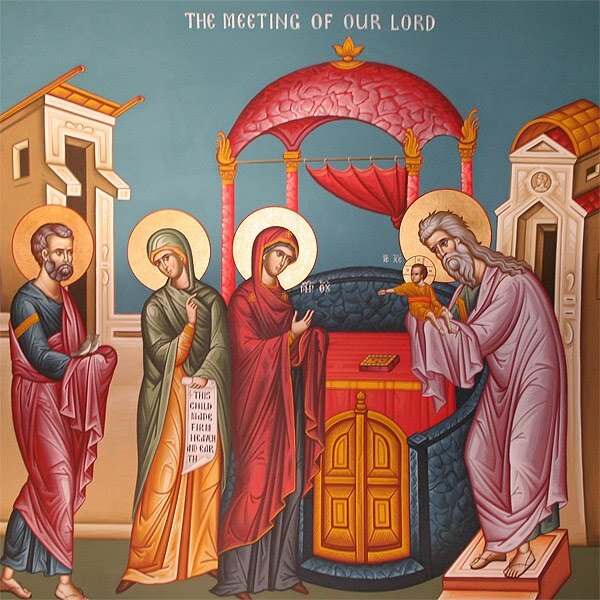 While, on the Feast of the Presentation of the Lord, arranged great processions throughout towns and villages as well as a solemn prayer service (Litia) to ask for deliverance from evils, and the plague ceased. In thanksgiving, the feast was elevated to a more solemn celebration. In Rome, the feast appears in the Gelasian Sacramentary, a manuscript collection of the seventh and eighth centuries associated with Pope Gelasius I, but with many interpolations and some forgeries. There it carries for the first time the new title of the feast of Purification of the Blessed Virgin Mary. In time the custom of holding lighted candles during the service in Jerusalem’s practice can be traced as early as 450 AD, a custom which spread to other areas of Christendom which gave way to some of the names used within Western Christian traditions, that referred to the feast as Candlemas (“Chandeleur” in French speaking lands and “Lichtmesse” in German speaking lands). Nevertheless the importance of Candlemas caught on slowly in the West during the Middle Ages, as indicated by its absence in the Lectionary of Silos (650) or in the Calendar (731–741) of Sainte-Geneviève of Paris. While in the tenth century Benedictional of St. Aethelwold, bishop of Winchester, has a formula used for blessing the candles. However Candlemas did become important enough to find its way into the secular calendar. It became the traditional day to remove the cattle from the hay meadows, and from the field that was to be ploughed and sown that spring. References to it are common in later medieval and early Modern literature; Shakespeare’s Twelfth Night is recorded as having its first performance on Candlemas Day, 1602. Furthermore it remains one of the Scottish quarter days, at which debts are paid and law courts are in session. Meanwhile the earliest surviving depictions of this feast can be found on a mosaic in Santa Maggiore (5th Century) and on an enamelled cruciform reliquary in the Lateran museum (circa 5th – 6th Century), but the final form in which it takes occurs sometime around the 9th and 10th centuries, and has remained virtually unchanged since. The main texts on which the feast is based upon primarily revolves around the gospel account in Luke 2: 22-40. Nevertheless we have Old Testament references (Gen. 22:1-19, Leviticus 12, Exodus 13:12-15) which cite the practice of this rite of purification and dedication to which all Jews were expected to perform without exception, to which the Virgin Mary and Christ would have certainly undergone even if we had no gospel reference to. In addition to this, the Church also drew upon the New Testament era apocryphal writings which though not recognised as Scripture, were utilised as historical references to clarify various aspects of the events of this feast and its importance to Christ’s ministry and adherence to the Law, (just as His naming and circumcision which would have taken place eight days after His birth, in accordance to Jewish Law). In more recent times, the General Assembly of SYNDESMOS proposed a World Day of Orthodox Youth to be celebrated annually on 2 February, to coincide with the Feast of the Presentation of the Lord. Members were urged to implement the celebration in their local parish churches “through concrete and appropriate activities that celebrate youth as an essential part of the Church’s present and not just its future.” This proposal has received the blessing of the primates of all the local Orthodox Churches. Great Vespers – Exodus 12:15-13:16; Leviticus 12 and Numbers 8; Isaiah 6:1-12, and 19:1,3-5,12,16,19-21. Divine Liturgy – Hebrews 7:7-17 and Luke 2:22-40. Yet out of all these readings, the key foundational text for the feast day is taken from the gospel of Luke 2:22-40 which is recited in the Matins and the Divine Liturgy of the day. Like the feast of the Circumcision (1st January) the Presentation of Christ in the Temple shows us the “Author of the Law accomplishing what was laid down by the Law” (Vespers, Tone 1). It is in effect the consecration of the first born Son of God (Ex. 13:2) and the sacrifice of the Purification after the birth of the male child (Lev. 12:6-8). Yet within the gospel narrative, the theme of Mary’s purification is almost overlooked, the central focus is on the former point, that of Christ’s dedication which is a “meeting” (upapanth) of the Messiah who represents the New Testament and the traditions of the Temple and the Law which symbolises the Old Testament, often personified by the figure of Simeon. Of course as cited earlier, Christ had no need to be presented in the Temple by virtue of the fact that He is the Son and Word of God, the Messiah who is the Consolation of Israel and the light of the Gentiles. Yet in assuming our human nature through His earthly birth at the Incarnation, He freely condescended and submitted Himself to the same rigours of mortal life, as all humans are subjected to, including obedience to the Law. Furthermore through His Incarnation, He progresses through each stage of life, experiencing and blessing the human life cycle, sanctifying all ages, indicating that salvation is possible for all age groups and not exclusive to one over another. That is why Christ does not come down from the heavens as a fully formed adult, to distinguish only one stage of life as worth living, but belongs to the greater mystery of creation which is growth and development that bring their own experiences and insights. We could liken this experience to that of the four seasons, whereby each season brings forth its own unique character which would see dormancy in winter, new life in spring, growth in summer and maturity in autumn with the setting of fruit and seed which will contain within it the essentials for continued life for the coming year. If we also consider the fact that the Messiah submitted Himself to the experiences of normal human physical, emotional and intellectual growth, then it was only natural that the Theotokos would do the same, since she too must fulfill the Law and the prophecies. The Righteous Joseph also displays this obedience and submission to the Mosaic Law, regardless of the fact that together with the Theotokos, even if some may assert that this was not necessary, he had been placed with the responsibility of caring for the Messiah’s natural progress and “upbringing” through the stages of human existence. Hence the Theotokos and Joseph needed to provide the correct Jewish environment with strict adherence to the spirit of the Law in which to allow Christ to grow and perform His function. With reference to Simeon the Righteous and Anna the Prophetess, we are given an example of patience and faith, as well as realistic expectations of what one may wish to accomplish in their lifetime. In Simeon’s case particularly, he had one specific desire which was to witness the Messiah, and like Anna, he knew that this was not a flimsy unachievable dream, but was a promise from God. If there was some sort of disclaimer clause which could serve as an obstacle, it was the need to not depart from God, and to patiently wait and trust in Him. Thus the focus that both Simeon and Anna had, was to work towards our ultimate goal, which God teaches us, is the Kingdom of Heaven. For seeking the Kingdom of Heaven would not be restricted to only those who had the necessary financial or physical resources, but could be attained at any stage of our lives, whether in our youth or in our senior years, even from the confines of a bed for an invalid. As we can see, God only reveals things to those who do not depart from Him, but undertake the journey with Him which is the patience of preparation and duty to which Simeon and Anna did. Anna had demonstrated this through her many years of service to God combined with prayer and fasting. This example is a formidable testament and guide for those who are elderly or lonely and wonder what they can do to serve God. Meanwhile the references that Simeon makes about the Consolation of Israel refers to the joy of the deliverance that the Messiah is expected to bring Israel, yet opinions amongst the Jews were divided as to how this Messiah will do it. Those well versed in Scripture knew that the message and ministry of the Messiah was a universal and humble one which would bring the message of faith, the light to the Gentiles. This is summarised in the “Canticle of Simeon” (Lk. 2:29-32) which is a confession and experience of all worshipping Christians (even today), because it cites that Christ is still the salvation God prepared for all peoples, the light of the Gentiles and the glory of Israel. However as we read on in the New Testament many Jews (particularly many of the clergy and scribes) misunderstood the task of the Messiah, quite often believing that he would be a king and conqueror, a nationalist hero who would not only expel the Romans from Israel, but who would go on to extend the power and glory of Israel, thus subjecting Gentiles under his rule. Yet Simeon alludes to this misunderstanding when speaking to Mary when he cites that Christ will be the cause of many to fall and rise within Israel, those who will stumble over Christ’s ministry and reject and crucify Him, and those who will accept Him, who will fall with Him, only to rise up through the Resurrection of life. Simeon also alludes to, that at the time of Christ’s Passion, Mary will suffer the sword of pain which (according to tradition) she escaped in childbirth. Seeing her Son on the Cross, her soul will be pierced in grief. The traditional festal icon shows that the meeting takes place inside the Temple and in front of the altar. Usually the altar has a scroll or book upon it and is covered by a canopy. The Theotokos stands on the left hand-side, holding out her hands in a gesture of offering. 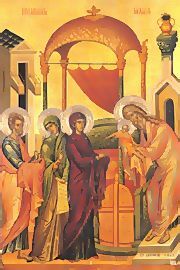 If one observes the one hand of the Theotokos is covered by her cloak (maphorion) as she had handed Christ over to Simeon. The icon normally shows Christ as a child and in proper clothes as opposed to the swaddling cloths seen in the icon of His Nativity. He is clothed in a small robe or tunic and his legs are bare, while appearing to be bestowing His blessing upon all. Within the icon Simeon is shown to be the most important person in the icon, since he represents all that was good, and all that was God-seeking in the Old Testament community. Encountering the Incarnate Word of God present in the Infant Jesus, the Old Testament people, (personified by Simeon), reached their fulfillment. Thus completed, it can recognize the dawn of a new age, the Age of Redemption, and see the close of its own era. In more specific observations we see that Simeon holds Jesus with both hands which are covered, thus showing his reverence towards the Messiah. Simeon is bare headed and there is nothing to show that he is a priest. Some Biblical scholars claim that Simeon may have been a priest of the Temple, or a Doctor of the Law, (with some even claiming that he was the son of Hillel and the father of Gamaliel, who was the teacher of St. Paul). Meanwhile Joseph stands behind the Theotokos, and is carrying the two turtle doves for the sacrifice. 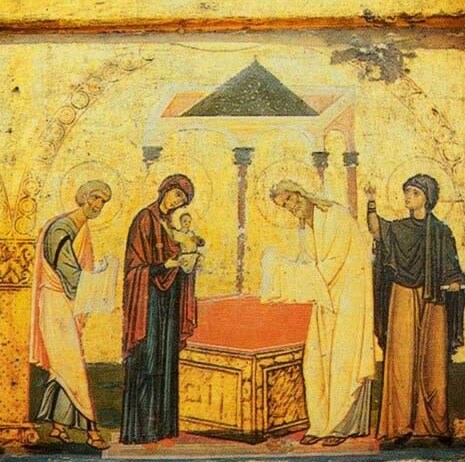 While in some icons Anna the Prophetess also standing behind the Theotokos, is pointing to the Christ child. In other icons Anna sometimes stands behind Simeon, but she is still pointing to Christ. The reason why Anna is pointing, in both styles of icons, is to announce to all of creation that the Child to Whom she is pointing to, now presented in the Temple, is the Creator of Heaven and of Earth. Thus for us, the icon is a call to discover Christ, to meet Him, and accept Him as our Lord and Saviour. This prayer is sung daily at the evening Vespers services of the Orthodox Church. 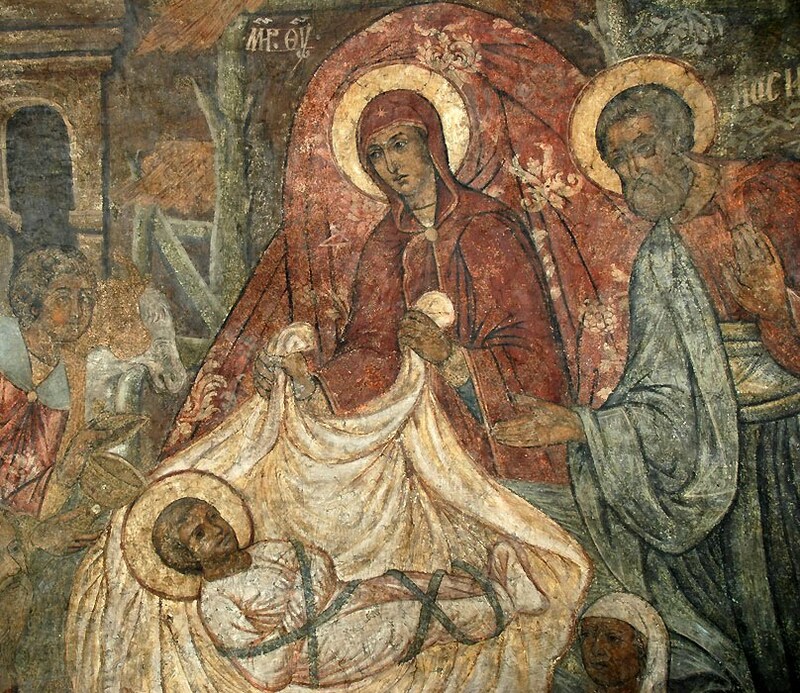 Your birth sanctified a Virgin’s womb and properly blessed the hands of Simeon. Having now come and saved us O Christ our God, give peace to your commonwealth in troubled times and strengthen those in authority, whom you love, as only the loving one. It is interesting to note that according to Jewish beliefs, was that there are two types of purifications, the one for sin or moral/ethical “degeneracy”, and the one for sacredness, like shedding blood, birth-giving and death. The latter were viewed as sacred acts that showed that one was undergoing a divine action and was working in synergy with God, and therefore needed to dedicate an appropriate time for its fulfillment. Blood because it was seen (as its is in our Church) as a life force, death because it is a passage (metastasis) into the eternal life and birth since it is an entry into life which is a gift by God. This is why when wars were concluded the surviving soldiers had to atone for the act of shedding another person’s blood and taking life which is sacred and should only be done in self defence. While women were, at the times of their menstruation, excluded from partaking within liturgical life to allow them rest during their time of pain, (remember they did not have all the medical conveniences that women today have! ), since they were undergoing a natural process of shedding the life-giving force of blood which is necessary for child-birth. Thus women at these points were perceived to be going through a sacred process, since it meant the continual health of their wombs. SYNDESMOS is the World Fellowship of Orthodox Youth, this a federation of Orthodox youth movements and theological schools around the world. The deliberations of this decision took place in June 1992. Simeon, along with John the Baptist, is often considered to be one of the greatest and last amongst the Old Testament Prophets, who marks the end of the Old Testament era which has its focus centred upon the Law, while the meeting (upapanth) of the coming era of the Messiah as shown by Jesus, represents the New Testament era and the fulfillment and expression of the Law by the Lawgiver. Thus Simeon exclaims that he is free to die and pass into eternal life for amongst all the Prophets he was the only one blessed to not only witness the Messiah, but to hold and embrace Him when performing his set ministry, something that John the Baptist did not do, as he himself cites, was unworthy to even undo the straps of Christ’s sandals. Not its letter as the Jewish clergy often did at that time.